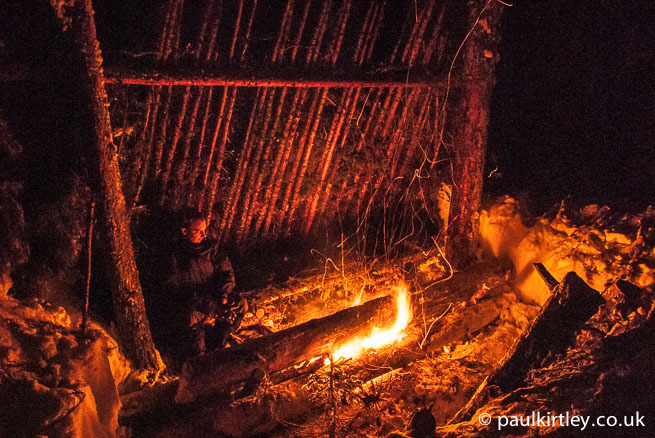 Lean-to shelters have become one of the touchstones of bushcraft, particularly northern forest bushcraft. 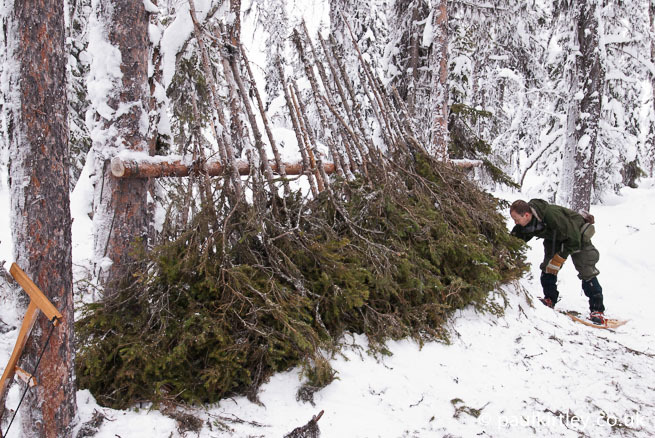 They are often held up as superb survival shelter – in combination with a long log fire – ideal for surviving cold conditions with limited or no sleeping equipment. This combination is indeed very effective in keeping you warm through the night. It is entirely possible to comfortably sleep outside in ambient temperatures significantly lower than inside a domestic freezer. 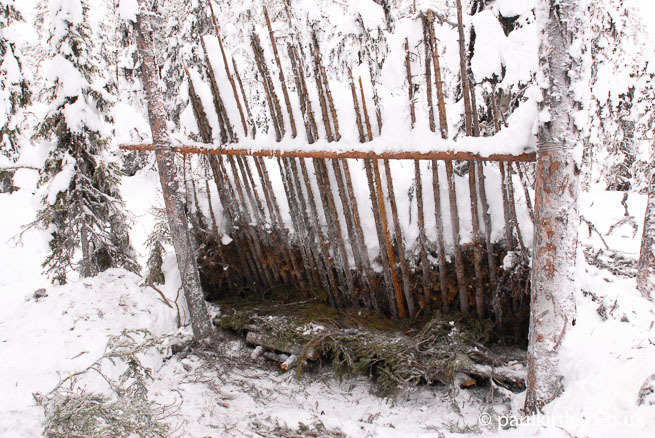 It’s worth bearing in mind, however, that this type of shelter takes some time to construct. Particularly when working on snow. You can’t just rock up and create one like pitching a tent or tarp. 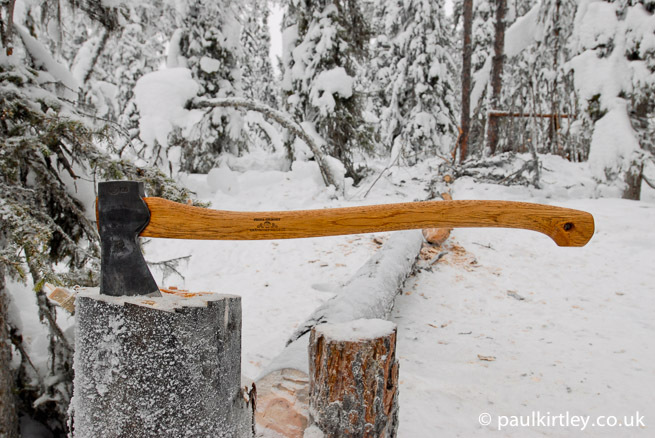 You need the right tools too, preferably a snow shovel and a suitable axe as well as a folding saw. 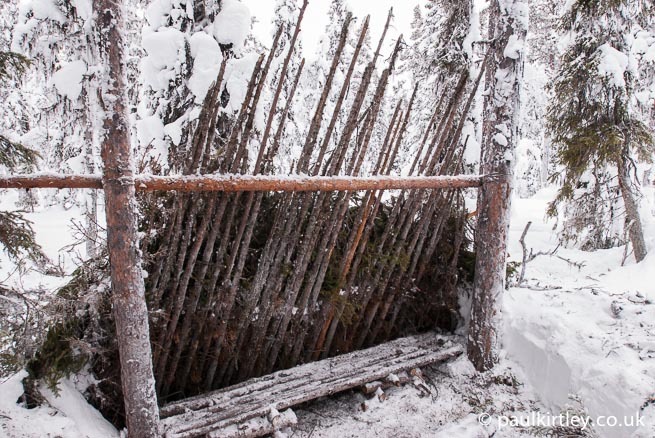 You could, at a push get away with using only a folding saw for shelter construction but it would be an even more time consuming affair to prepare the materials – particularly removing all the branches from the small spruce or pine trees. 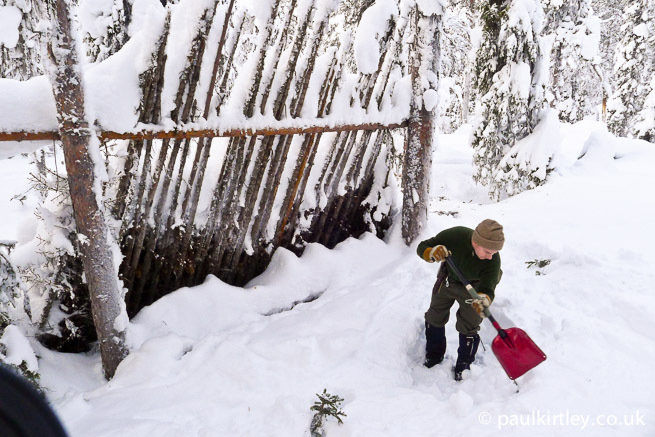 You could excavate the area needed with a snow shoe and your gloved hands but it would be inefficient compared to using a snow shovel. It would be impossible, though, to fell the size of dead-standing timber you need for an effective long-log fire without an axe. Anyone who has ever built a half decent shelter in temperate conditions knows it requires a significant amount of time and energy. It requires more in the northern forest in winter. A lean-to is a resource-heavy construction too. You will need to fell scores of small trees to construct one properly. 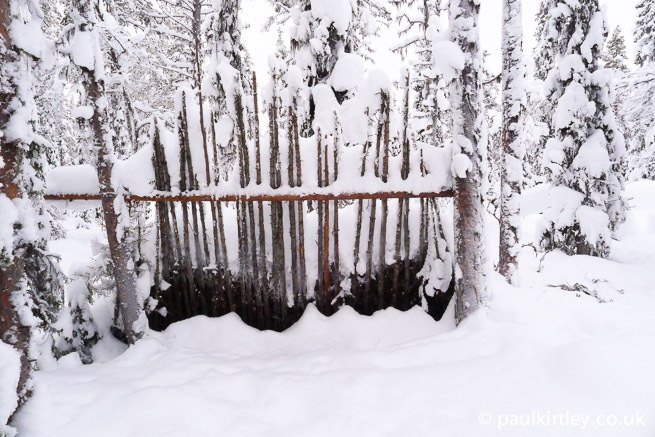 Even the shelter depicted in my previous article on lean-to shelters for the northern forest had the uprights spaced as far apart as practically possible so as to minimise the number of trees culled. This is in an environment where trees grow very slowly. 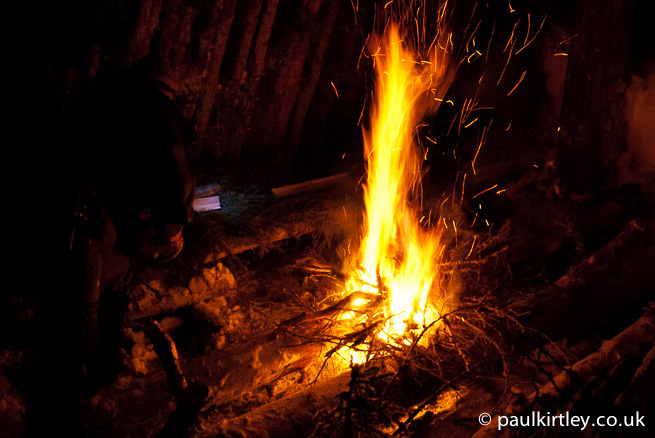 A long-log fire is not a leave-no-trace way of keeping a bivouac warm either. It will take one dead-standing tree per night to keep you warm and burning it will leave a scar on the fragile ground. When you use this shelter combination, you have a significant impact on the local environment. 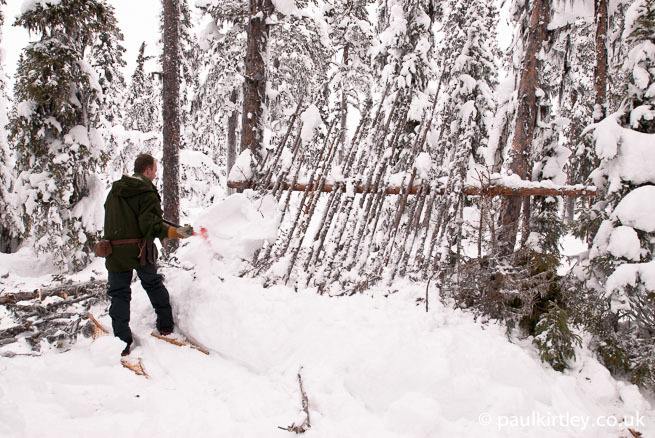 There are survival shelters you can construct in a snow-filled winter forest which are quicker and require fewer tools than a lean-to. It seems to me that where the lean-to comes into its own is as a shelter to which you will return. It makes the initial effort much more worthwhile and the use of materials more justifiable (and sustainable). A well-constructed lean-to is also a robust structure which will last for many years. It was with this in mind that my winter camping friends and I returned to a lean-to built a year earlier. In particular, Stuart was keen to sleep out in a lean-to with a long-log fire in arctic winter conditions. 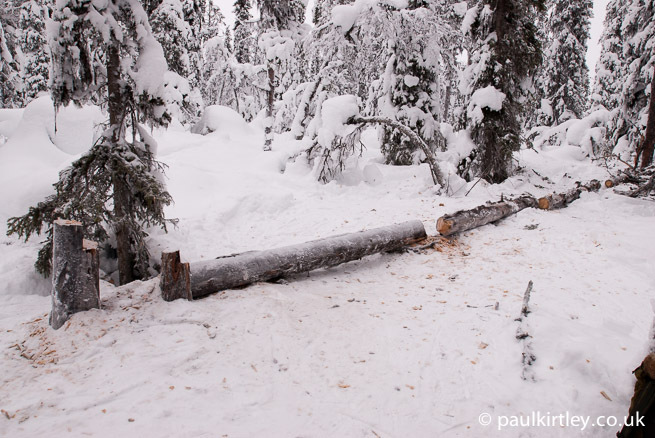 We set up camp, pitching the heated tent and collecting some firewood. The old lean-to from the previous year was nearby, at most a few hundred metres away, up on a spur between a swamp and a lake. We just had to find it. That’s easier said than done. You’re looking for a wooden structure made of the very type of trees is set amongst. Also, it would be covered with snow, on one side at least. On this trip there was a lot more snow than the previous year, getting on for a metre (3 feet) more. So, we waded up through deep powder onto the higher ground. It didn’t take too long before we were in the right area. But we didn’t see the shelter at first. We’d approached it from one of the rear corners. It was, as expected, largely covered in snow on the back side. How I remembered the lean-to, after spending the night in it. Photo: Paul Kirtley. How the same lean-to looked when we found it a year later. Photo: Paul Kirtley. To get this lean-to back to being a functioning shelter which would keep Stuart warm and safe through the night, would require some work. First a large enough area to house a long-log fire had to be cleared in front of the shelter. The sleeping platform had to be cleared and bedding later put down. The old thatching had slipped down the angle of the shelter. So, snow on the back of the shelter, sitting above the level of the sleeping platform would have to be removed so it wouldn’t melt and drip onto the occupant. Once the snow had been removed, new thatching had to be added. Oh, and we needed to find a dead-standing pine tree to provide Stuart with his fuel for the night. Stuart gets to work clearing the area in front of the shelter. Photo: Paul Kirtley. The shelter resurfacing. Photo: Paul Kirtley. Starting to clear the back of snow. Photo: Paul Kirtley. Getting there! Photo: Paul Kirtley. While Stuart worked on the shelter. I sourced the firewood. Photo: Paul Kirtley. While you could manage to build a lean-to without an axe, this tool is necessary to obtain the sizeable fuel required to stay warm without sleeping kit. Photo: Paul Kirtley. The shelter taking shape again. Photo: Paul Kirtley. Starting to look more like home for the night. Photo: Paul Kirtley. It had taken all afternoon to renovate the shelter. Gathering new thatching and bedding material was one of the most time-consuming aspects. We were fortunate in that there was a good dead-standing pine close by. We had made our own luck though. When the shelter had been built originally, the availability of a good amount of firewood in the area was a factor in its location. This resource was particularly important as we were not using the shelter just as a one-off. Lighting a fire in the conventional way between the two base logs. Photo: Paul Kirtley. Fire establishing. Photo: Paul Kirtley. After an afternoon of working in the cold forest, Stuart enjoys the benefit of the fire. Photo: Paul Kirtley. Stuart starts to really feel amazing heat kicked out by this type of fire (hat and gloves removed!). Photo: Paul Kirtley. Iain joined us up at the lean-to to share the warmth of the fire. Photo: Paul Kirtley. Now that the lean-to had been revived, it could be used night after night. All that was needed was a supply of firewood each day. Having this shelter available for multiple nights, made the effort of renovation worthwhile. Moreover, using the shelter for a second year made the original effort to build it more worthwhile. It also made the use of the materials required to construct it more justifiable. 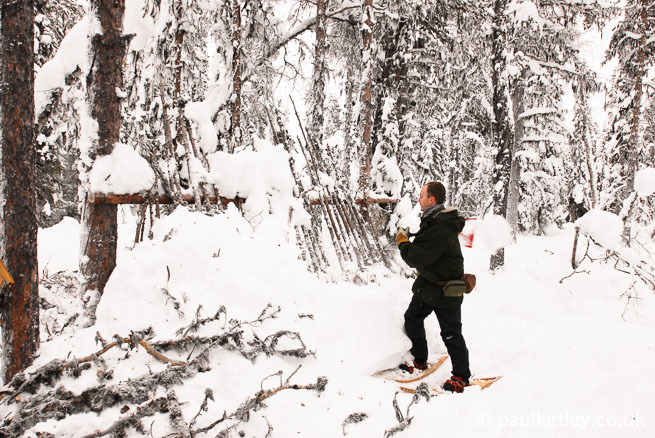 We had created – an ultimately biodegradeable – bolthole in the arctic forest on a route that we had taken in the past and were likely to take again in the future. 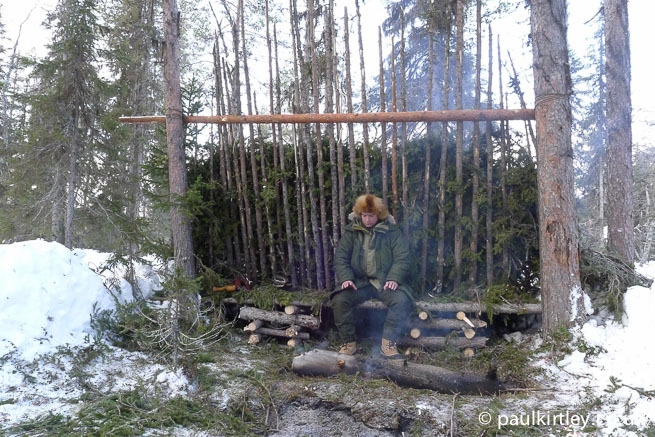 To my mind, this illustrates the fullest realised value of a lean-to in the arctic forest. 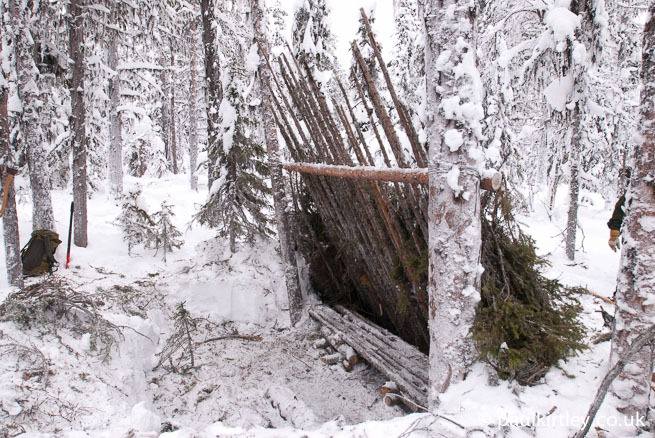 I’d be interested to hear if you have used this type of shelter for winter camps or if you have used other more rudimentary survival shelters, either in training or in practice. Let me and other readers know in the comments below. How would you make an improvised shovel? One way to imorovise a snow shovel is to wrap some fabric — spare bandana, T-shirt, etc — around a forked branch and then peeing (of course, any water will do, but urine does not take additional effort to obtain) on it. Once it freezes it can be used as an emergency snow shovel. Making a wooden shovel takes a few hours of work for a good one, and requires tools and some skills. But it will last longer. Thanks for the answers Paul and Pär. The second film Paul pointed out actually shows you a snow shovel actually being made from 32 min on too. Hi Paul, while I agree that these type of shelters are fun to build, and great for a longterm bushcraft camp I don’t beleive these are practical to consider as a “survival” shelter. As a fellow wilderness survival instructor, I beleive it is imperative to carry shelter such as a tarp, poncho, emergency blanket, emergency bivy etc, and this is what I stress to my students. Usually when someone gives in to realizing they are lost and will have to spend the night it is very late in the day and very close to darkness. They need a very expedient shelter so they can concentrate on other aspects of survival such as fire and water. 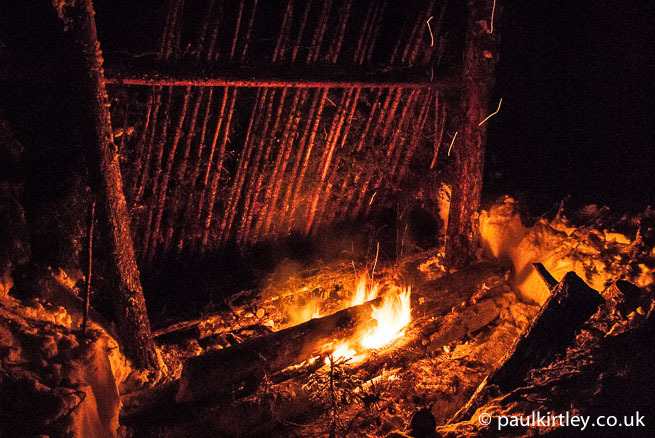 Now don’t get me wrong, primitive shelter building and fire skills are fun and wonderful to learn but in my opinion they fall under the categories of bushcraft and primitive living skills, not wilderness survival. In my opinion the key to survival is preparedness, which in my mind means proper kit and the knowledge to use it. Hi John, yes I completely agree. It took several hours to renovate this shelter, never mind build it from scratch. And we were well fed and had the right tools. I hope that serves to illustrate to a wider audience that there are more expedient survival solutions. Your point about when someone decides they are benighted is an extremely important one and, in my opinion, not emphasised enough. Thanks for adding another sensible voice to the argument. I like the raised bed/chair. How is this shelter when the wind blows? Seems wherever I position mine the wind always find a way in. Another brilliant article, you really highlight the amount of work this type of shelter takes to build, but also the value and reward you get from your investment. A fantastic way to a part of the winter landscape. I’ve grown up in South Yorkshire spending almost every weekend out in the woods and countless school holidays camping with my younger brothers. We never had any money growing up so whenever we camped out we’d build shelters, typically the type mr. Mears illustrates in the first bushcraft book I ever owned, as a leaf hut. It’s surprising how warm a tiny fire combined with a decent amount of boughs under you can keep you. I do remember one night however in mid winter, I’d have been around 16 my brothers 12 and 6, when we’d found a fallen pine tree that had landed at a T on top another fallen tree. Quite securely it had made a space under it for a perfect shelter, and we adopted the lean to type design to spend the night. (There’s a photo at my face book page) We all got comfy and made a long fire. Around 4am I realised we’d had around 4 inches of snow over night, the shelter had also protected the fire so I built it up and had a great winter adventure come the morning! I’m 26 now and quite looking forward to taking my daughter for similar adventures when she’s a little bigger (she’s 2 now). Nice to hear from you. Thanks for your comments and I loved your story about camping out with your brothers when you were younger. Thanks for sharing. I was recently taught this by a fellow bushcrafter on the bladesandbushcraft.com forums. I must say it is a very effective shelter and kept me warm in 0 degree weather! It’s good to hear that you’ve had a positive first experience with this shelter type. Thanks for your comment and keep in touch. Hi Paul, a brilliant article. I think this reinforces the belief that many of the “survival” shelters we see in the manuals were originally seasonal hunting lodges, designed so that they could be returned to each season, repaired, restored and reused over and over. I have never camped out in the Arctic before, but I spent a bitter night out in Sussex a few years back. I camped in a modified kennel shelter, which was partly open down one side to expose the upper torso. 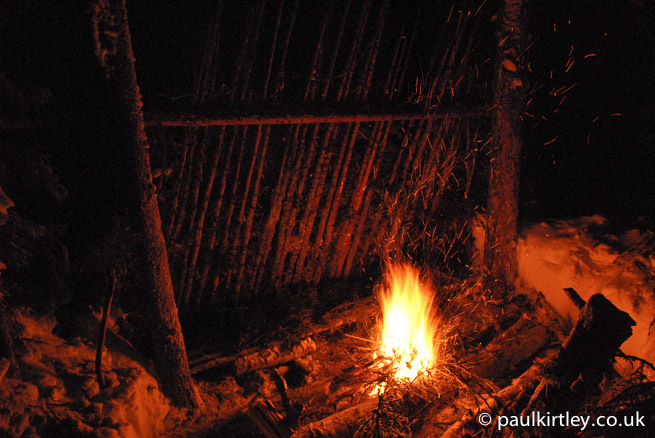 I lit a good sized fire before this opening and built a log reflector behind it, so that not only was heat thrown into the shelter, but the fire was also self fed. It proved extremely comfortable, and it was relatively easy to clear away the evidence of my fire. With hindsight I would definitely build a bed next time. Thanks Josh, I’m glad you enjoyed this article. And I think the point you make about survival shelters vs seasonal lodges is a very good one. You’re right about making sure you have a good bed aswell – the value of insulation from the ground is often greatly underestimated. I noticed that you used fresh spruce branches for the bedding. In various experiments we have found that using dry bedding you will sleep warmer. The hypothesis is that you will expand a significant amount of heat drying the fresh spruce branches, while the old, dry and far less soft and fragrant branches are already pre-dried. You have to be a bit more careful with the fire, but will sleep warmer. Thanks for your comment. I completely agree with you with regards to green material for bedding, particularly when you can find a comfortable alternative which is completely dry. In the case of this type of shelter, with the raised bed, I have found the best solution is to add just enough bedding material to make the bed bearably comfortable but no greater thickness. If there is too much bedding – dry or green – then the warmth of the fire is prevented from coming up from under the bed. So, the main reason for the bedding in this case is comfort, not insulation. I’ve found this harder to achieve with dead branches than green branches as the dead branches tend to break up into small pieces when there is only a thin layer. By contrast here is a picture of a bed using dry branches from one of our intermediate courses, where the aim is to provide maximum insulation/warmth from the bed and bedding. First of all, thanks for the article, the pictures are awesome! Last summer, we made two lean-to’s at a 90° angle, giving room for up to 3 people to sleep in it. 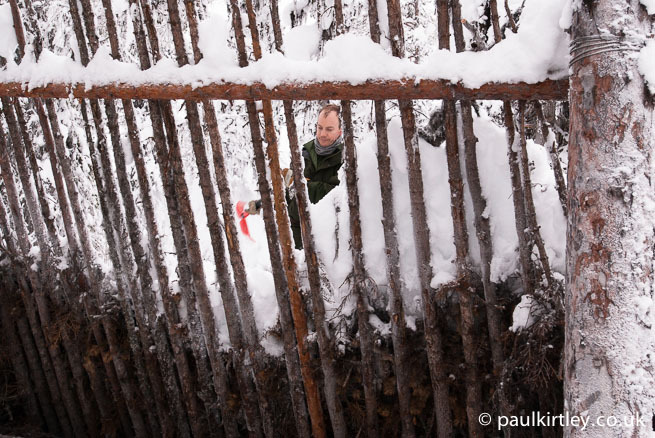 In March we’ll be going back to Sweden, trying to revive the shelter just like you and Stuart did. We made the lean-to initially to give other people the opportunity to spend a night out in the wild, sleeping in a natural shelter. I’ve heard about 10 people have slept in it in the meanwhile, so our harvesting of materials is also justified in my opinion. As always thanks for your comments. Sounds like it was a worthwhile investment of time, effort and materials. Since you asked for it, here’s a link to a little trip-report I’ve made about the trip in March. Paul another great article, I do like to use a lean to when I have a lot of time and materials, and I also know the advantages of carrying your own shelter and they are very useful. One shelter I have found very useful recently is the Mors Korchanski Super Shelter, kit needed is simple and light weight ( thin polythene and a milar ) and only a few logs or branches needed, relativley quick to erect and can be very warm indeed. Apologies, I missed your comment the other day. 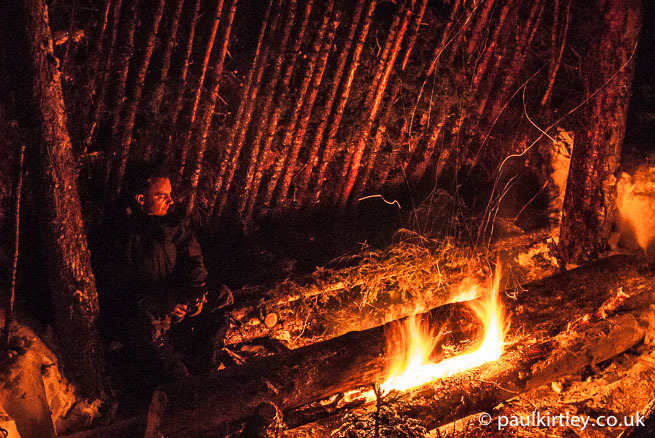 Yes, the super shelter is a neat design, combining natural materials with man-made ones and the benefit of a fire. I haven’t made a lean to since I was a kid. It’s nice to read a refresher course though. I have been 2-man tenting it for sometime and fixing to try hammocking. I love to try it all. Yes, it’s good to be open to all ideas and use what is appropriate at the time. I hope you get the opportunity to try one of these again at some point. I made a lean-to shelter while on my two year WW coarse, it stood the test of time, through very strong wind, heavey rain and snow. The roof was thatched with grass, people said it would leak, but it never, pics in my FB albums. I had a lot of cosy nights in it, and the long-log lay fire kept me warm from tip to tail. I’m glad this article brought back some happy memories of cosy nights. Sounds like you had a solid shelter there mate. I’ll check out your FB album. I am used to building winter lean-tos a bit different than yours. A steep angle is used for shedding rain, a more shallow angle used with snow and cold temperatures, in fact snow is piled on the thick roof of the shallow angle lean-to to provide more insulation and a solid wind break. 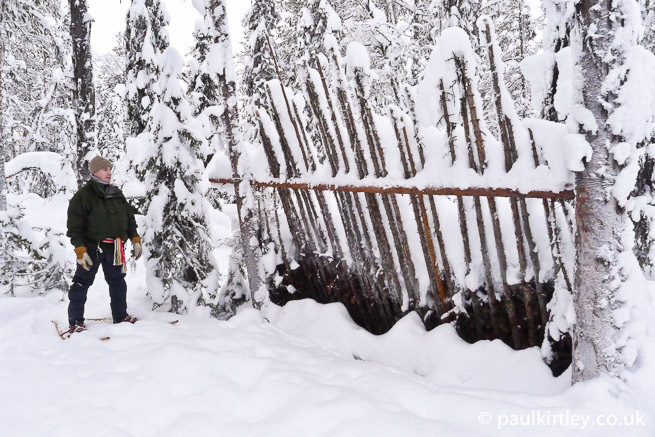 This shallow angle and snow protects against strong winds that would blow through and blow over a tall lean-to. The sleeping platform looks like a good idea, but is a lot of work. I am used to using a couple feet of spruce boughs covered with fir boughs that are flatter and less prickly. When kept small and banked in with snow to stop drafts makes for a warm bed with little work. The whole goal is to make a small draft free den with a couple feet of densely packed insulation around you. The opening is low and protected from winds if possible. It is hard to get a fire to warm you all night without being too hot or too cold or awake all night tending it or worried about it. I’ve used the long log wall most often as a reflector and wind block, with its burning being incidental. Most often I like to built the lean-to facing a rock wall as a fire reflector, wind break and heat storage. Please talk about the reasons for the steep angle and platform over a litter nest and if it offers advantages over the way I have done things. I learn a lot from your points of view. Thanks Paul. Thanks for your comments. I want to address all of your points/questions as they are good ones. But before I highlight some of the points I made my original lean-to article, I just want to check you have read this one as well? Very good evaluation of the difficulties involved in shelter construction. Too often they are overlooked. I’m also not a huge fan of the leanto shelter because it is so exposed. A bit of gusting wind, and you can have rain or show beating in your face. It also provides negligible insulation, instead depending on a large fire to keep you warm. They are still fun to build and use, but I prefer more enclosed shelters. In cold weather I just prefer to carry a properly rated sleeping bag. It tends to weigh less than the tools needed for shelter construction, and can be set up in minutes. There’s nothing wrong with relying on a big fire for warmth in severe cold. In fact it’s much more important than the shelter itself. 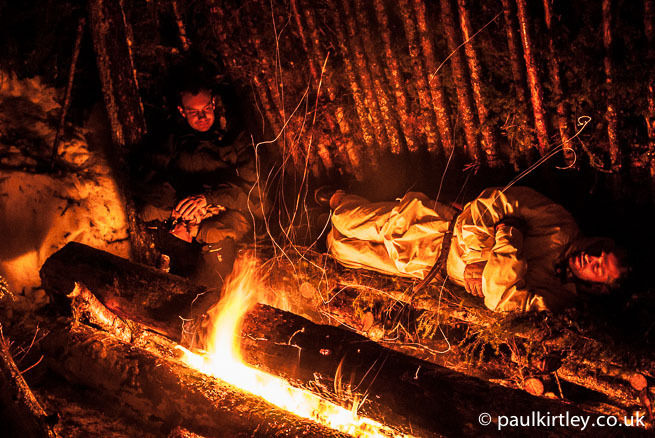 If you don’t have sleeping kit with you, there is no shelter that does not rely on a fire for warmth that you can build in which you will be as warm and dry as you will in front of a large fire, particularly when the temperatures get down properly low. Therefore, I completely agree that a properly rated sleeping bag is the single most important piece of survival equipment you can carry in cold winter conditions. PS I enjoyed reading about your Mount Washington trip – a good case in point with regards the sleeping bag. Hi Paul – Great article and images! There is a video on youtube where they recommend an inch (of the diametre of your logs for the fire) for every hour you intend to have it burn – in your estimation, would this be correct? Hmmm, the mathematician in me can see a flaw in that. If you double the diameter, the volume of fuel is going to go up by 4x but the surface area a little over 2x. That will change the rate at which it will burn. If you don’t believe me, take a small log, cut it in half lengthways, then split one into splints and leave the other whole. Then add both to an established fire and compare the rate at which they burn. That’s before you take into consideration any differences in relative density of different sized trees or trees from different areas or the water content of the wood. I’ve had chance to watch these videos now and I think they are an honest account of someone trying this out. It’s also worth pointing out he’s using two logs rather than three, which always creates a slower burn. I appreciate the discussion your articles open up and the open way you accept it. One of the important considerations of a shelter is that it may have to be build when for some unforeseen circumstance you find yourself missing important gear like your sleeping bag. An overturned canoe, a snowmobile that dies miles from anywhere, a plane crash. These are important skills and ideas you are bringing forward and exploring by testing, that just may save the life of a reader. Thanks. I really appreciate the discussions we have here. I’m always keen to listen to others and grateful when they choose to share their views/ideas/experiences unreservedly. We all benefit. If there are good ideas out there, then we should be sharing them. As you say, it may save a life. It’s also worth having as many options open to you as possible. As long as we know how to prioritise as well as choose techniques appropriate to the situation, and have the experience to apply them effectively, then knowing more can only be beneficial. 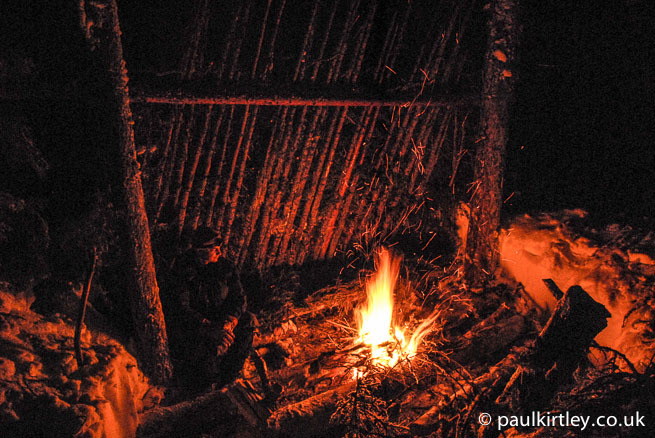 Great article, just back from a camp out … Got drenched enroute to my chosen spot, an used a long fire to dry out and to keep warm through a frosty night in the mountains. I used a tarp … .. But Interesting comments made on dry bedding for sleeping on … I’ve learnt a thing or two here, and good points on preparedness . I agree with the points made earlier … Darkness falls quickly and things become more difficult at night. Great advice … Thank for sharing. Ill sleep better in the woods this year for it. Another excellent post Paul, i really enjoy reading your blog, i learn something new every single time. Makes me want to get out side and go practice what i’ve learned. P.s quality photos too, they speak louder than words. Take care and enjoy putting your skills into practice. Great read Paul, and enjoyed the input from others. 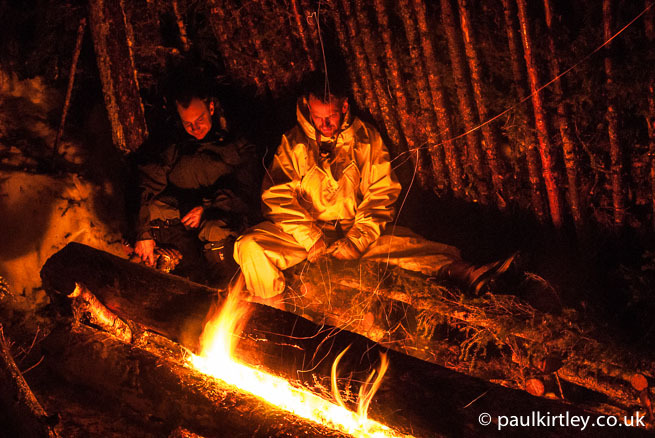 You mentioned that long fires not good in winds / rain – what do u recommend in survival situation to keep warm and help dry out? I think the comment was more about the protection a lean-to shelter afforded against rain in the context of gusting wind. 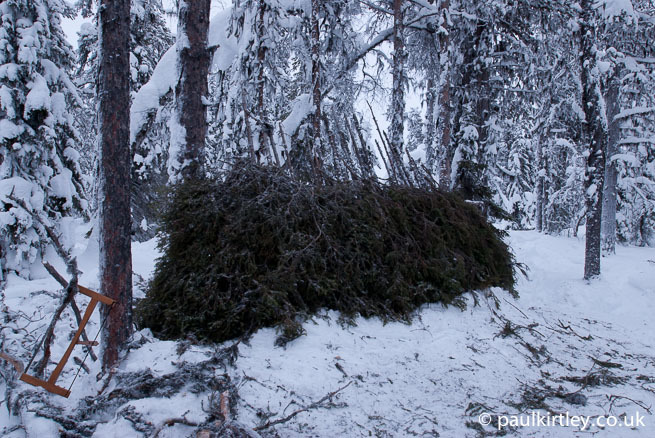 This shelter was built in the arctic forest in February so that issue is pretty much academic. In any situation, you have two basic choices with regards to shelter – one which relies on body heat alone (and is generally small and enclosed) or one which relies on a fire. In cold, dry conditions, a big fire alone will keep you alive. In wet/windy (and therefore warmer) conditions, a more enclosed shelter may be the better solution. Sometimes when I’m out and about I come across old shelters and fire pits. Someone mentioned earlier that your revisited lean-to was more bush craft than survival. I think it pointedly illustrates the making use of what you have or find in a survival situation.